Next week it is infoShare time in Gdansk, Poland! InfoShare is the biggest Tech conference in the CEE region. Over 5000 attendees will be inspired by more than 120 international speakers. The line-up is amazing. During the two conference days I will be hosting the Inspire stage. As part of the preparation I met online with some of the speakers. The first talk was with Michał Sadowski (@sadek), CEO of Brand24. I was curious what “Inspiration” means to him. Michał answered that it’s fuel to him, that it makes him do things. He just needs daily inspiration. Therefore, he starts his day with reading about things going on in the industry, listening to podcasts, reading the Elon Musk biography, things that inspire him to do some cool stuff. Apart from the usual idols like Elon Musk and Steve Jobs, Gary Vaynerchuck is an important source of inspiration for Michał, among others because he is very outspoken. But, probably resistance is the main source of inspiration. Although being successful in Poland, many people told him that they wouldn’t be able to sell their services abroad. Currently, they subscribe hundreds of new foreign B2B clients monthly. Recognition, at least if well deserved, for himself and his product, which is his baby, is Michał’s main driver to work, it’s neither money nor expensive cars or tools. The funny thing is that Brand24 is being used to receive brand recognition, so his business is well matching his personal needs. When asked how he tries to inspire others, the talk moved into a very personal direction. “Honestly, I’m a person who loves humble-bragging. I know my place in the industry, there are way more people with far greater achievements, but anyway I like to celebrate and give up about my small successes”, he honestly admitted. Besides, Michał noticed that sharing these small successes and practical lessons learned inspired others to start companies as well, although this directs his current way of blogging, he never intended or hoped to inspire anyone. Michał believes that education, evangelisation is the best way to sell a product. That’s how he tries to inspire the market. Therefore, he shares a lot of practical information online and during his presentations, he trains people how to make use of applications they can benefit from and in most cases, it is not his own product he talks about. 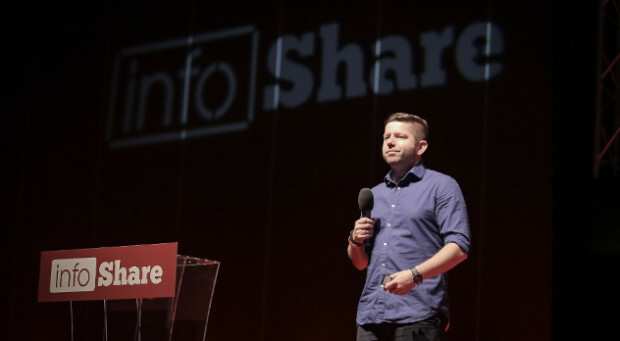 Michał wishes that infoShare will help Polish companies to become more successful internationally, because “If they develop and grow, I can learn from them as well”. To make that happen, he feels things must change. Michał promotes a culture of openness, where people share results, numbers, the tools they use, without looking around for spies. He feels the lack of trust is still an issue in Poland. People want to sign NDA’s for everything (or in fact for nothing). He wants to promote that people start to talk and share ideas without being worried that people will immediately steal them. That’s the only way to learn from each other. And therefore, Michał practices what he preaches, this year again at infoShare. If you want to learn how to start your business, how to get the first customer, join Michał at the Inspire stage. He promised to share knowledge that you can implement the next day and hopes to inspire you to start your own business. Thursday, 18 May 2017, 16:15, “10 kroków budowy online biznesu” (10 steps to build an online business).